This holiday season, give the gift of relaxation with a gift card from the Elevate Health MedSpa. Our MedSpa offers a range of relaxing services from our massage therapist and esthetician (acupuncture coming soon!) that can provide that special someone on your list with a rejuvenating and healing getaway from everyday life. 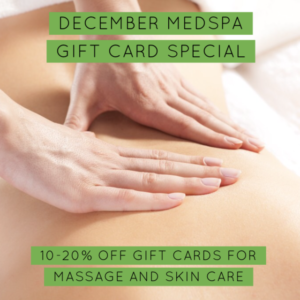 For the month of December, we’re offering a 10% discount on all MedSpa Gift Cards! Wishing you a safe and healthy holiday season!